Editor’s note: This story was original published in 2017. Paul Pruce moved to Philadelphia in 2015 from a small town near Scranton, Pennsylvania, for a job. He was excited for his new job as a personal trainer that brought him to the city. Unfortunately, the opportunity fell through after just a few months — and he was stuck in Philadelphia without a job. He’d started driving with Lyft on the side about a month before he lost his job. Above anything else, the flexibility hooked him. He’d been using the gig as a fall-back while he looked for another job, but decided to stick with it full-time, driving 45 to 50 hours a week — and earning about $800. Pruce’s girlfriend is in college two hours away, so he likes that he can adjust his hours as needed to visit her. As a Lyft contractor, he can work whenever he wants. He doesn’t have to sign up for shifts. He just logs in when he wants to take rides, and logs off when he doesn’t. The conversations are a great perk, Pruce says. The job is so rare, the doctor told Pruce he only performs about six surgeries a year. Pruce isn’t a medical expert, but he had the same question, too — and the Lyft ride gave him the opportunity to ask it. “I guess most of the time is actually taken up with consultations and all of the stuff they have to look into prior to separating them,” the doctor told him. Pruce is always open to opportunities that might arise from driving. He’s even made some new friends of Lyft riders, and he’s happy he’s in the city. Philadelphia is a unique environment to drive in, he points out. The city’s main attractions are sports and history, he says, which attract very different types of tourists. 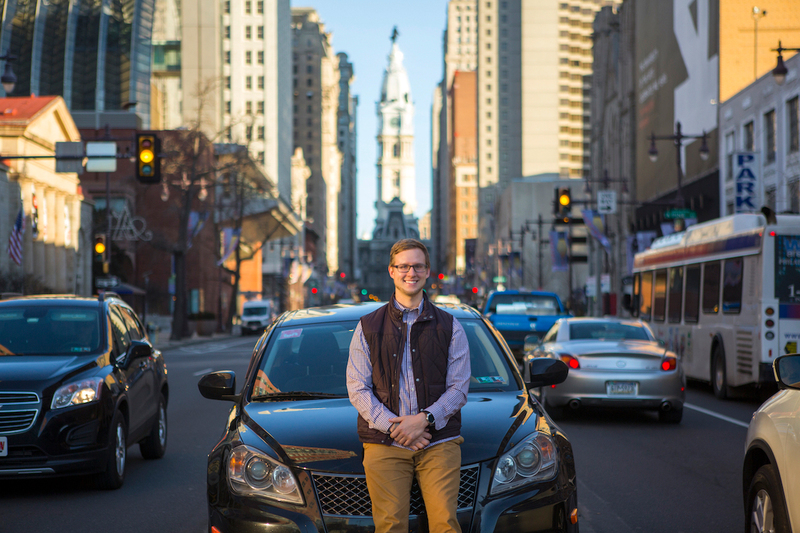 With a variety of popular sports — football, hockey and basketball — a Philly Lyft driver can stay busy year-round. “At least once a week there’ll be some sort of game, and then the college areas get very busy as well,” Pruce explains. The number-one piece of advice Pruce offers to anyone thinking about getting started with Lyft is to just try it. “My biggest advice would be if they have any interest at all, do it,” he urges. “Not necessarily just go cold turkey and quit (your) day job, but I would say if (you) have any interest at all, at least go through the application process, get everything approved,” Pruce says. If you’re not looking for a new career, he says it can make a good safety net if you’re between jobs, or a way to supplement income from a job that isn’t paying the bills. He acknowledges Lyft may not be for everyone. If you don’t enjoy driving or hate the idea of spending time in traffic, it’s going to be a challenge. Ridesharing also involves more interaction with people than you might expect, so you should be open to those serendipitous conversations. Being a driver works like this: You sign up with Lyft and work when you want to. You keep a portion of ride fees and 100% of passenger tips. Lyft says drivers can earn up to $35 an hour. Your car has to be 2005 or newer (2007 or newer in Pennsylvania), have four doors, pass a safety inspection, and have up-to-date registration and insurance coverage. To qualify as a driver, you have to be at least 21 years old, have a driver’s license and at least one year of driving experience. In addition to driving full time, Pruce recently started working part time as a driver relations rep. He’s cut back driving hours just a bit, so now he earns $750 a week driving, plus a bit extra working a few hours a week training new drivers. Pruce works with drivers who’ve signed up to use the app, but haven’t taken their first ride yet. He says the most common hesitations are being unsure how to use the app or people being uncomfortable having people in their car. Pruce’s job addresses these concerns. He meets with hesitant drivers to act as a rider and walk them through the process, so they can get over the hurdle of taking the first ride. Now that he’s been driving full time for more than a year, he also has a few tips to share with new drivers. Though you can set your own schedule, Pruce pointed out some hours are better for business than others, so you should plan wisely. Sign in during those times when you know demand is high in your area. He commits himself to starting about 6:30 or 7 a.m. to profit from morning rush hour. After that, he’s flexible, depending on what comes up throughout the day. He also says not to worry if you don’t know a city well. Being a driver is a great way to become familiar. Dana Sitar (@danasitar) is a writer and editor at The Penny Hoarder.